Beautytiptoday.com: Lose Weight With The Flat Belly Diet! Even the skinniest women sometimes complain about their flabby bellies. Crunch after crunch, abdominal sit-ups in every position, and still, the jiggly tummy is there. So what's a gal to do? Try the Flat Belly Diet, of course! You can lose weight with this diet plan. That's what the editors at the popular health magazine Prevention say. And why not? Prevention's editor-in-chief, Liz Vaccariello, put the diet plan together with the proper nutrition folks. The Flat Belly Diet was introduced to the world last January. And now four months later, the diet plan is helping many women and men lose stubborn tummy fat. The weight loss plan is all the rage these days, so we decided to explore the diet a little further. The Flat Belly Diet sounds too good to be true. You get to eat yummies like chocolate and pistachio nuts and get to refrain from abdominal exercises. What? No crunches? No. Not a one. The good MUFAs in the Flat Belly Diet include: nuts, seeds, oils, avocados, and dark chocolate. You are scheduled to eat 4 times a day, and consume 400 calories at each meal. For instance, Liz revealed one of the delicious breakfast recipes---a Cherry Chocolate Waffle. Take a frozen waffle. Heat up. Melt some semi-sweet chocolate chips over the waffle, and top with a few cherries. There---what a tasty breakfast. The MUFA in that one, is the chocolate drizzled over the top. Now, some dietary experts are pooh-poohing the Flat Belly Diet, calling it a scam, an unhealthy amount of food intake, etc. Others claim the diet plan is a rip-off of the Mediterranean diet which encourages healthy oils, seeds, nuts, olives, and so forth. But the people on the Flat Belly Diet, love the plan. One woman lost 47 lbs. in just 5 months. Another dropped 3 pants sizes in months. It couldn't hurt to look into the diet plan. Everyone loves a flat belly. The diet plan does include great foods like nuts, avocados and olive oil. I mean, you're not eating cardboard-tasting rice cakes all day. Check with your doctor and see what he or she thinks. 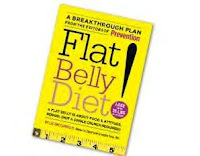 For more information, visit: http://www.flatbellydiet.com/. Thanks for inforemation on this diet. I had a baby last year, and still have a pouch I can't get rid of. It sounds so good. Hope it works. Who doesn't love choclate? It is rated as highly beneficial in treating obesity and weight loss. It has been branded by science and media alike as the best Jessica smith Williams supplement for losing weight that acts as a vigorous catalyst when taken in the right amount. The extract has a unique and inherent ability to start hormone production, specifically ones that stimulate fat-burning natural mechanisms within.